I was born in a farmer’s home in the Tamang community of Nepal. I had to collect 10-12 sacks of fodder a day. I used to wake up at 5 am and bring 4-5 sacks of grass. After that I used to go to school, the place where I rested after my gruelling morning work then went back to collecting 6-7 sacks of fodder after school. We had a small farm where we grew enough food for our family. My family was poor and it was difficult to get money for my education, but I continued to study nonetheless. After passing my SLC in 1999 I came to Kathmandu. I was unfamiliar with it and it was scary for me. The first time I was in Ratnapark, I saw many disabled and helpless people. I felt bad for them and used to give them all my travel fare and walked home instead. I studied music but I was not a good student so I failed. On top of that my tuition fee was $35 per month, which was out of my budget range. So I just dropped out of college. In Nepali society women are pressured to marry early or else we face the stigma of being “undesireable”. To avoid this social pressure I got married at 23. Today I have two children. I have been working hard non-stop ever since. The day before I gave birth to my child, I was working and took three months maternity leave. I never wasted time and kept myself busy with work. The first work I did was embroider shawl with glitters. I used to work day and night to earn $0.6 per day. I worked hard and eventually saved enough to buy a machine. One day I was walking around Mary Ward School in Jhamsikhel. 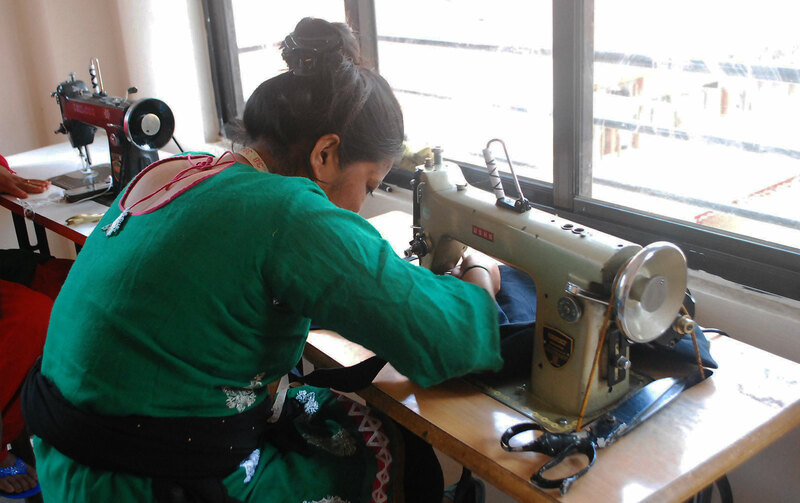 Karuna Lama, who was a teacher there, approached me to take a tailor training from the school without any charge. I got trained in sewing by my hands and also learnt how to use a machine for almost a year. The school provided clothes where we could learn and I was allowed to bring my baby during the trainings which gave me great flexiblity to learn. There were times when it was difficult but in order to hone my skills I had to deal with every problem that may have been on my path. After my training was over I worked 2-3 months in a Montessori School from 7am -7pm. It was fun to be with children, but I had to leave since I couldn’t give enough time to my own child. Plus I wanted to begin my dream of sewing as a career. While I was in training at the school I bagged first prize among 25 people. That is when I realized that I would make a career in tailoring, pursue it to the next level and support my family with it. I perfected myself by practising on clothes of people without charging them. I worked in a boutique for a short period of time. After sometime my neighbor informed me about an organization called Hausala Creatives. They provide co-working space, create handmade items, encourage craftsmanship, and empower women. I joined the organization and here I am today pursuing my career in tailoring. I have been using mainly Dhaka as a material to make all our products since it gives a traditional touch and is popular in the market as a typical Nepali product. 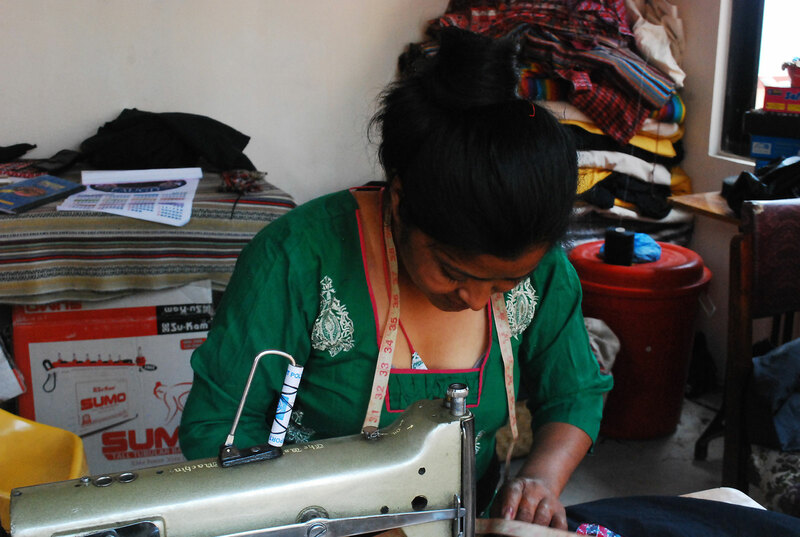 Dhaka has been my main focus because I want to promote traditional Nepali fabrics in the products. During last year’s earthquake, the organization helped me a lot as my home was destroyed, but more than that it also gave me an opportunity to help other people as well. Since last year, I have been training girls and women from two villages (Dhungkharka and Chasingkharka) in weaving and stitching. To be self sustained women need skills besides an education. They should be able to survive in any corner of the world. I can vividly remember the moment when I wanted to wear fitting clothes. I used a sickle to cut the clothes and sew it with my hand. There were machines and scissors in modern and wealthy places, but we had no access to them. With my limited tools, I used to make clothes for newborn babies. I want to perfect the skill I have. There are people in our society who label tailoring as a low form of work, but I want to change that perception and make our community understand the value of this work. Today, in whatever little free time I have I spend it by getting involved in my local political work. Today, I am also seen as a social worker in my society.